ROCHESTER, N.Y. — Monday’s 7-0 Rochester Red Wings win over the Buffalo Bisons could be represented by the cartoon clip of a Looney Tunes baseball game, where one team was getting so many hits that the players did a conga line around the bases. The Red Wings didn’t score 42 runs in four innings like the Gas-House Gorillas did to the Tea Totallers. But they did set season highs in hits and doubles, with 17 and seven respectively, to improve to 33-33 in front of 3,957 fans at Frontier Field. Zack Granite, Matt Hague and John Ryan Murphy each had three hits, while four players – Tommy Field, Mitch Garver, ByungHo Park and J.B. Shuck – placed two apiece. All nine starters in the lineup made an impact on the box score; each player recorded at least a hit, run scored or run batted in. All seven runs were scored in the first four innings, including a four-run third. It was plenty of run support for starting pitcher David Hurlbut, who allowed just four hits and struck out seven in seven innings of work. The stellar night on the mound was even more excellent when compared to a rough outing for Buffalo left-hander Brett Oberholtzer, who only made it through 2.1 innings. The Wings could grumble about leaving 14 runners on base another day; they’ve now scored five or more runs in six of the last 10 games. “We’ve got to lead the league in close ballgames this year. I mean one-run games, two-run games, it’s been a way of life for us,” Wings manager Mike Quade said. “When you’re struggling offensively and you’ve got decent pitching and we play good defense, you’re gonna have this. Park has four multi-hit performances in his last five games, raising his average from .191 before the recent series with the Pawtucket Red Sox to a current .221 clip. Aaron Slegers will look to replicate Hurlbut’s outing on Tuesday, another 7:05 start, but it will be no easy task. 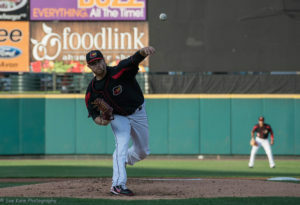 Hurlbut was already pitching well before facing Buffalo, but he dominated the Herd. Two of the Bisons’ hits were bunt singles, which made his showing even more impressive. Returning home after a week on the road usually figures to be an additional advantage, and it finally proved to be for the Wings. Rochester is 14-16 at Frontier compared to 19-17 in away ballparks, but perhaps some shutout ball was just the turnaround Hurlbut, Park and the rest of the squad needed. “It’s nice to have the comfort of the facilities here,” Hurlbut said. “When you’re in, let’s say Pawtucket, somewhere else, you’re just not super familiar, there’s not a weight room. Here we have everything we need to get ready and you don’t have to do something you’re not ready to do. I have all the bands and stuff here to get ready for a game.